1. Preheat the oven to 180°C, gas mark 4. 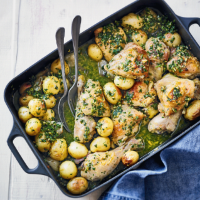 Place the chicken pieces in a large roasting tin with the shallots and new potatoes. Mix together well with the olive oil, garlic and preserved lemon then season. Pour over the wine or stock. Cover tightly with foil and roast for 30 minutes. 2. Meanwhile, place the pine nuts in a small roasting tin and place in the oven to toast for 4-5 minutes until golden. Set aside to cool. Place the herbs and cooled pine nuts in a food processor and blend to a coarse paste. 3. Remove the tin from the oven and discard the foil. Roast for a further 40 minutes until the chicken is golden and thoroughly cooked, there is no pink meat and the juices run clear. 4. Spoon the herb paste into the tin and toss well before serving. Delicious with green salad or seasonal vegetables.